North Korea on Tuesday lashed out at the US for standing in the way of the two Koreas’ efforts to improve inter-Korean relations, a day before South Korean President Moon Jae-in’s special envoy is set to travel to Pyongyang. The Rodong Sinmun, the official newspaper of North Korea’s ruling Workers’ Party of Korea, carried a commentary titled “Blocking North Korea-South Korea relations is blocking the US’ own road ahead.” It called upon South Korea to pursue inter-Korean projects without being influenced by the US. It called upon South Korea to pursue inter-Korean projects without being influenced by the US. “The driving force for North Korea-South Korea relations is within our people, and the pace of advancement (of those relations) is up to a timeline we set,” the commentary said. 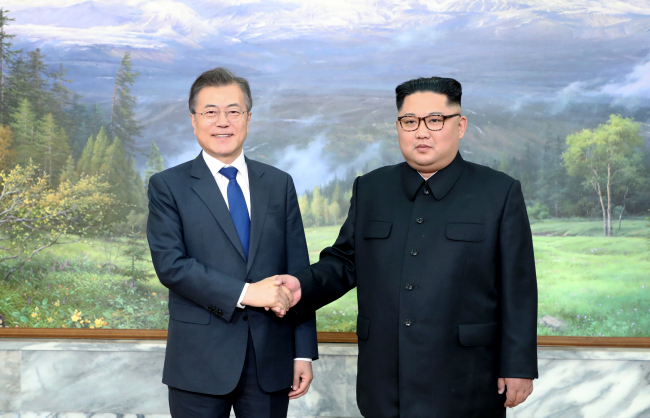 In the Panmunjom Declaration signed at the April 27 inter-Korean summit, Moon and Kim agreed to work toward the complete denuclearization of the Korean Peninsula, reduce cross-border tensions and expand inter-Korean exchanges. However, stalled denuclearization talks have put the brakes on Seoul’s efforts to broaden inter-Korean cooperation, with the US reiterating that progress on inter-Korean relations should be in tandem with progress on North Korea’s denuclearization. The talks between the US and North Korea have showed little progress due to differences over what should come first in the denuclearization process. The US wants North Korea to take concrete steps to denuclearize first, while North Korea wants the US to declare an end to the 1950-53 Korean War first. Citing procedural problems, the US-led United Nations Command recently declined to approve a visit to the North by South Koreans for the purpose of conducting a survey on a railway there, which analysts say shows Washington’s discomfort with the accelerated pace of inter-Korean cooperation. Plans for a joint liaison office in North Korea’s border town of Kaesong have also been delayed. The government hopes that the special delegation led by national security adviser Chung Eui-yong will help North Korea and the US find a middle ground so that the stalled talks can move forward. In Pyongyang, the delegation will put forward the idea of declaring an end to the Korean War first in return for the North Korean leader’s verbal promise to take initial steps to denuclearize, such as providing a list of its nuclear weapons, according to a local media report. “The US is positive about South Korea’s idea to declare an end to the war involving the leaders of three or four countries in the event Chairman Kim (Jong-un) promises to take early steps to denuclearize within a specific period of time,” an unnamed diplomatic source was quoted as saying.